When traveling, I like to get a sense of the local fare. Eat something local. 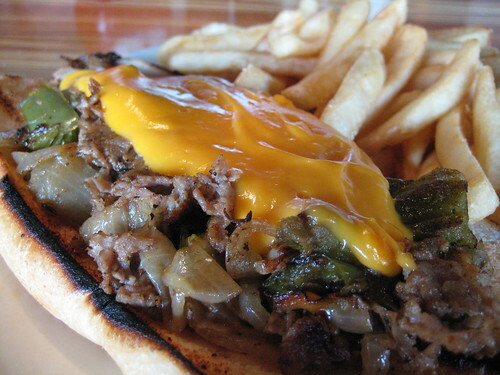 But sometimes all you want is a Philly Cheese Steak. Such was the case in Savannah, where we stopped at Tubby’s Tank House after checking out River Street; something came over me, I just had to have it. And it was good. Could have used a little less Whiz, but otherwise a very tasty meal. The fries were forgettable, but that’s okay… I just wanted the steak, onions, and peppers. 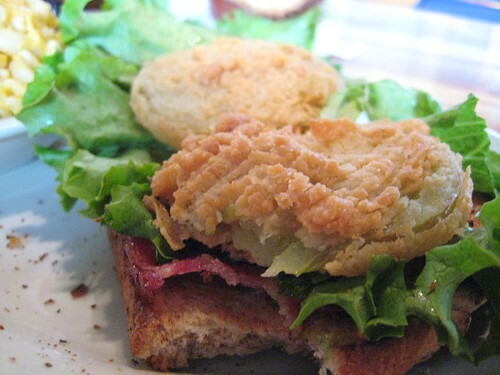 I had a bite of the Fried Green Tomato BLT as well, and I’ve got to say that it’ll be on my list of things to get the next time I’m in town. The fried green tomato doesn’t taste like any tomato I have ever eaten, although it gets props for being situated next to the thick-cut bacon. Beautiful. Very unique, definitely southern, and surprisingly not on all that many menus that I’ve seen. The sky may have been slightly overcast, but the air was warm and the wait at Tubby’s was about 30 minutes for a table. But you can get full service at the outdoor bar, and there were a few stools free. If you needed another reason to take an immediate seat, they also serve up one hell of a Bloody Mary, full to the brim in a pint glass.